Plant City is in the middle of a resurgence and has been described as a destination by Fox 13’s Charley Belcher. 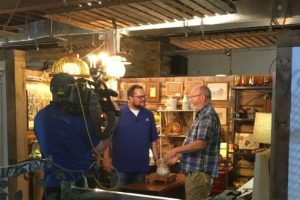 Charley recently visited us to highlight the shop on his t.v segment called Charley’s World featured on Fox 13 News “Good Day Tampa Bay”. He spoke of the shop as being a big part of this up and coming downtown’s re-growth. To him, visiting The Mercantile was a “slam dunk”. Charley Belcher is known for supporting and promoting small businesses in the Tampa Bay area, so it was a no-brainer for us to reach out to Fox 13 news and invite him to the shop. Charley came out to Plant City to meet us personally and chose to feature us on his show. 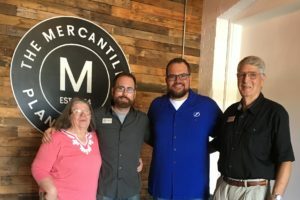 He loved the buildings 100-year-old history and our story of opening and running The Mercantile. On May 23rd, Charley and his production crew arrived at 6:30am to start filming. Throughout the morning, Charley visited with us and our vendors to highlight the inventory and showcase all we have to offer. He expressed that The Mercantile has everything from antique to the unique and art to everything in between. Charley also said our building itself is fun to explore and has tons of personality. The new addition coming soon with opening our 2nd floor was discussed and we look forward to having Charley back when this next phase of the store is finished.